Speaking to the stars and using glimpses of the future, Fait battles for good with her Scythe and Orb! Also, for a limited time, we’ve added a new Avatar and Weapon Skin for Orb to celebrate the 2019 Winter Championship! We’re also rolling out the first phase of language options on PC. Additionally, we’ve changed the Brawl of the Week to Switchcraft 2v2, added some new Test Features, made a few bug fixes, and updated the free-to-play Legend Rotation. Also, Butterscotch wears the shades in the “Deal With It” Taunt. We’re celebrating our 2019 Winter Championship (Feb 9th-10th) and International Winter Championship (Feb 22nd-24th) with two new cosmetic items for a limited time in Mallhalla! Registrations for the 2019 Winter Championship and the International Winter Championship are available now at smash.gg/brawlhalla. Even more Switchcraft mayhem! Get a teammate and jump into this crazy 2v2 Stock battle. Pick 3 Legends and watch their weapons and sigs get jumbled up. Battle equally scrambled opponents and try to knock out all 6 of their Stocks first to win! Check out the new Sale items! We’re excited for this roll out, so please try it out and give us feedback! Fixed a crash where the controller would disconnect in online games with poor network connections. Fixed a crash on Xbox One after suspending or signing out the user. Fixed a rare crash on Xbox One when joining session invites. Fixed a case that caused the Unarmed Ground Pound to have a larger hitbox than intended when held for a long period of time. Fixed a case that caused the Lance Ground Pound to have a larger hitbox than intended when held for a long period of time. Lucien Side Blasters: Fixed a bug which caused the damage and force charge bonus to be greater than intended. (Credit: samantha-may). Made revisions to the Medieval Dragon KO effect to improve performance. Directional Dodges can be Gravity Canceled into a grounded attack within the first 5 frames. The attack is based on the direction of the dodge: A downward dodge will only cancel into a Down Light or Down Signature. Spot Dodge and Chase Dodge behavior is unchanged. The Experimental version of Twilight Grove has been removed. While it did reduce evasive play on the right side of the stage, the new geometry hindered movement at a large degree when trying to recover back to the stage. We’ll continue to investigate further on how to enhance a player’s experience on Twilight Grove. We’ve removed the Ledge Canceling test feature. It did not provide a consistent solution towards accidental ledge cancels and had too large of a disparity between keyboard and controller users when intending to activate a ledge cancel. This one is coming back into the shop as we try some alternate variations that may better answer these concerns. We’ve also removed Dash Deflect from Test Features as it did not serve its intended purpose as a conscious counter-play option to thrown weapons. It would often result as a by-product of natural movement, rather than a reliable choice. We’ll continue to investigate other possible solutions of counter-play against weapon throws. This patch begins a series of updates and improvements we will be bringing to the more senior members of Brawlhalla. Particular attention has been placed on rebuilding Legend’s Signatures to vastly improve the accuracy of their hitboxing and hurtboxing, as well as updating any outlying Damage and Stun values to more appropriate ranges for their given Legend. Scarlet and Lord Vraxx have received a great number of priority increases on their Signature attacks as a result of the improved hit/hurtboxing, as well as certain attacks like Scarlet’s Down Hammer gaining more reliable Hit Windows. Bodvar also finds increased avoidance on attacks, such as his Down Hammer that bends closer to the ground. These improvements will continue along with each balance patch and are not limited to the range of changes in this week’s update. Scarlet Neutral Hammer: Improved Hurtboxing to more closely match animation. Improved Hitboxing to more closely match animation. Increased Damage from 20 to 25. Scarlet Side Hammer: Improved Hurtboxing to more closely match animation. Improved Hitboxing to more closely match animation. Improved animation timing and movement. Increased Damage of the ground version from a range of 22~15 to a range of 24~18. Increased Damage of the air version from 18 to 24. Scarlet Down Hammer: Improved Hitboxing to more closely match animation, resulting in an increased Hit Window from 2 to 8. Increased slide distance of the attack. Increased Damage from 15 to 23. Scarlet Neutral Lance: Increased Damage from 21 to 24. Scarlet Side Lance: Improved Hurtboxing to more closely match animation. Improved Hitboxing to more closely match animation. Increased Damage from 20 to 24. Increased Stun from 27 to 30. Scarlet Down Lance: Improved Hurtboxing to more closely match animation. Improved Hitboxing to more closely match animation. Decreased Damage from a range of 25~10 to a range of 23~15. Bodvar Neutral Sword: Improved Hitboxing to more closely match animation. Bodvar Side Sword: Improved Hitboxing to more closely match animation. Decreased Damage from 28 to 24. Increased Stun from 23 to 28. Bodvar Down Sword: Improved Hitboxing to more closely match animation. Bodvar Side Hammer: Improved Hurtboxing to more closely match animation. Improved Hitboxing to more closely match animation. Decreased Damage from 28 to 24. Increased Stun from 18 to 28. Bodvar Down Hammer: Improved Hurtboxing to more closely match animation. Lord Vraxx Neutral Lance: Improved Hitboxing to more closely match animation. Decreased Recover time on miss from 15 to 13. Decreased Damage from 33 to 25. Lord Vraxx Side Lance: Improved Hurtboxing to more closely match animation. Improved Hitboxing to more closely match animation. Lord Vraxx Down Lance: Improved Hitboxing to more closely match animation. Decreased Hit Window from 17 to 16. Lord Vraxx Neutral Blasters: Improved Hitboxing on the initial swing to more closely match animation. Lord Vraxx Side Blasters: Decreased Damage from 34 to 27. Lord Vraxx Down Blasters: Improved Hurtboxing to more closely match animation. Improved Hitboxing to more closely match animation. 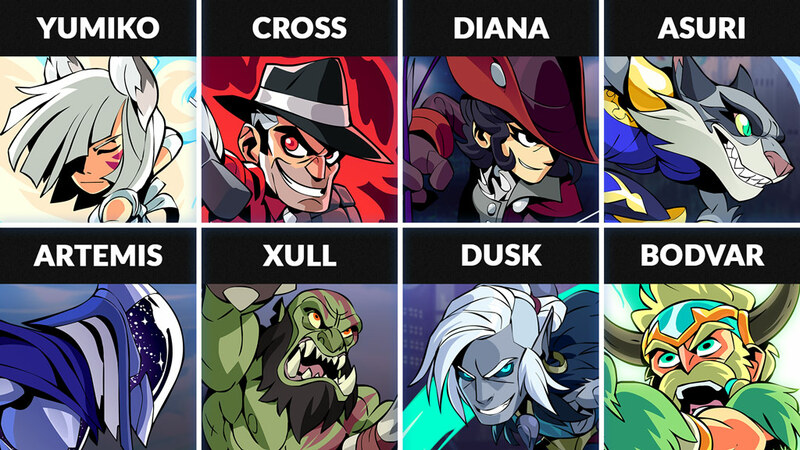 The new Legend rotation for this week includes: Yumiko, Cross, Diana, Asuri, Artemis, Xull, Dusk, and Bödvar. Yumiko – Holding the appearance of a blind seamstress, this centuries old fox spirit has been brought into battle wielding her Magical Hammer and Bow! Cross – For years he has owned New York City, but can he do the same in Valhalla? This charismatic mobster steps into Valhalla with Blasters and Gauntlets. Asuri – This Night Stalker has claimed the Tournament as her territory and sets upon challengers to her domain using Katars and Sword! Xull – With legendary physical strength, this Axe and Cannon wielding Orc Warlord is ready to challenge everyone and everything in Valhalla! Dusk – Wielding his Spear and a powerful Orb, carved from stone and magic, Dusk seeks to spread chaos throughout Valhalla.